In mild weather, clothing is mainly a matter of convenience. Yes you want to wear shoes that are comfortable to pedal in, and yes you don't clothing that is likely to tangled up with your bike chain, but aside from that you can pretty much wear whatever you like. On the other hand, if the weather is very hot, very cold or wet, then you need to take your choice of clothing more seriously, especially as regards those clothes that you choose to wear on your lower half. Cycling shorts are quite simply one of the best options, and something you really need to try. Don't be deterred by the fact that they look ridiculous in the shop, or that you feel odd (because of all the padding) wearing them the first time. The thing to remember is that they will keep you comfortable in the saddle, even if you ride your bike all day. Surely avoiding what could be a literal pain in the bottom is worth it? Furthermore if you're embarrassed about the amout that cycling shorts reveal, or if you find their tight fit to be unflattering, you can always wear baggy shorts or a skirt on top of them. 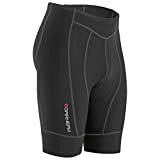 Cycling shorts are usually specifically designed for men's and women's different figures, but beyond that the choice can be quite confusing. The trouble is that expensive shorts often look almost identical to the cheapest ones in the store. Closer examination will however reveal the differences - the fabric - more expensive shorts are generally made from more breathable materials to help keep you cool and dry - and the sophistication of the padding. If you're commuting to work, you probably want to change when you arrive. Apart from not forcing your colleagues to endure a sweaty smell, cycling shorts probably don't look professional in the office and indeed you may not feel comfortable wearing them all day. If your employer provides changing facilities and showers you can use those, otherwise it'll have to be a quick change in the lavatory. On cold days, cycling shorts by themselves are probably not enough to keep you warm, even if you cycle as fast as you can. For this reason, you may wish to consider tights, and if you do wear tights, remember they should go on top of the cycling shorts, and not underneath. In very cold weather, you should consider wearing tights with a fleecy lining, and take care to ensure that your ankles are covered even when your knees are bent (if necessary get longer tights). In wet weather, you'll probably want to try to keep dry, so in these conditions you can consider wearing baggy waterproof trousers over your shorts. Be sure to choose trousers that are breathable, or you'll just end-up horribly sweaty. Breathable mesh design on both sides of waistband. The size for this short is Asian size,please choose ONE SIZE UP than you normally wear. Goodbye Cotton Tee.Say Hi Performance Cycling Jersey,a great value short sleeve cycling jersey offering excellent comfort in warmer weather,simple styling and a relaxed fit make this perfect for everyday use. For more than a decade, holding consumer-oriented principle, SANTIC provides suitable and professional technological sports equipment for sports enthusiasts, creates free and comfortable sporting experience and enhances the fun of sports with its passion, design and continuous innovation. PREMIUM & COMFORTABLE - This bicycling shorts are suitable for all levels cyclists, which includes road biking or mountain biker. It has a quick-dry and breathable feature which makes you feel more comfortable. Silicone leg grippers keep shorts in place,and 3D gel pad in key areas, moisture-wicking, quick dry. Sponeed-cycling company have 8-years experience in riding jerseys field, mainly produce all kinds of cycling clothes and equipment. Company focus on cycling clothes technology research and design with original brand and highest-quality products. 1.Combination of functional materials and an innovative mesh vent design for riders of all levels. 【High Wicking】 The fabrics feature effective water diffusion and wicking properties. It does not stick to the skin and shows cool crispy wearing comfort due to its capillary action. In addition, the dry touch can be maintained even it is wet. BACK MESH CONSTRUCTION helps improve the excellent breathability. 【Better Fit】 3D molded construction, multi-panel and 4 needles 6 threads flat-seam stitching design provides better fit and comfort. 【Satisfaction Guaranteed】 90 days no risk 100% full refund assurance if you are not satisfied for any reason, no questions asked. The 17D pad is excellent for long distance road or mountain bike rides. Muti-panels optimize comfort, and the soft, flat-seam construction prevents chafing. shock and reduces skin irritation. while giving excellent stretch, support and recovery. And the New compression fabric is a specialized material that has the maximum sun protection. The back is a stretchable power mesh for excellent breathability and quick-drying performance. Pearl Izumi Size Chart Pearl Izumi Chamois School 101 Escape from the workweek and take a ride in the SELECT Quest Cycling Short. Form fitting with an athletic, aerodynamic cut for enhanced performance. SELECT Transfer fabric wicks away perspiration to keep you cool and dry as you perform. M SELECT Escape 1:1™ Chamois:• Smooth next-to-skin interface.• Medium-density suspension core.• Pre-shaped and curved to the body. Elastic waistband. Silicone leg gripper offers a secure, comfortable fit. Reflective elements increase visibility in low-light conditions. 88% nylon, 12% Lycra® spandex. Machine wash, drip dry. Imported. Measurements: Waist Measurement: 24 in Outseam: 16 in Inseam: 11 in Front Rise: 7 1⁄2 in Back Rise: 15 in Leg Opening: 14 in Product measurements were taken using size MD, inseam 9.5. Please note that measurements may vary by size. NOTICE:Please CHOOSE THE SIZE BASED ON OUR SIZE CHART. Seat cushion with top 4D COOLMAX,riding transit can provide good protection,to avoid injuries caused by riding. 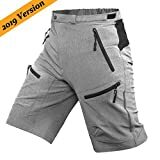 Baggy exterior and internal padded bike short.are highly functional for bicycle touring and mountain bike rides.Legs are non binding, elastic free and very soft to wear. As a large industrial enterprise which combines R&D, design and production, Santic cuts off all the middleman expenses, offers professional functional cycling apparel, shoes and accessories, sales throughout the world more than 30 countries, and becomes Chinese Cycling Association co-branding, China National Triathlon co-branding, the Tour of Qinghai Lake International Cycling Race co-branding. 1. The size for this products is Asian size. If you are from U.S.A or EU, please choose one or two size up. 2. Hand Wash / Machine Wash with cool water 30°, Do not dry clean, Do not tumble dry, Do not iron, Do not brush, Do not bleach. 【Highly Durable Materials and Baggy Design】: These shorts use cationic yarn-dyed fabrics, which are more durable and reliable. With elastic design, Cycorld MTB shorts are baggy and comfortable, helping you cycle more freely. 【Deep Pockets with YKK Zippers】: Our shorts has 4 spacious, deep pockets that can easily hold your mobile phone, keys, wallets and other small items. With high-quality YKK brand zippers, we make it easier than ever to open and close your pockets and get your things. 【Fit for All types of Biking】: Our MTB Cycling Shorts are non-restrictive, loose-fitting cycling shorts for all types of cycling environments, including mountainous areas, regular roads, and downhill. Besides, you can even wear it on a daily basis. What can Cycorld MTB Shorts do for you? 1. 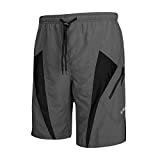 Durability ---- Cycorld cycling shorts are made of cationic yarn-dyed fabrics, making them much more durable than most. 2. Comfort ---- The bagginess and adjustable design of our shorts will help you stay comfortable. 3. Reflective Elements ---- Cycorld MTB shorts make use of reflective strips to improve visibility and safety. 4. Reliable ---- Our shorts have two waistband buttons with velcro, which makes them more reliable and secure. 5. Deep Pockets ---- Your phone, keys, wallets, and cards will all stay put in four deep, spacious pockets. 6. Adjustable Velcro ---- Adjustable Velcro straps ensure that these shorts will fit your waist size perfectly. Money back or replacement guaranteed from Cycorld in the case of any product issues! 【Ergonomic Fitting】This men bicycle shorts,half pants has a great moisture feature and a four-way performance stretch, 9-Panel anatomic design makes body fitting well, provide superior, chafe-free comfort. Supportive and breathable pad to ensure comfortability. Four-way stretch fabric with high-wicking facture to keep body fresh. Fantastic 9-panel-design knitting seamlessly which fits to move. Anti-slip spots & reflective logo make sure of non-chafing and safety at any moment. 90 days Warranty, 100% Satisfaction Guaranteed. It is never too late to buy and never too pitiful to choose. Add to cart now! 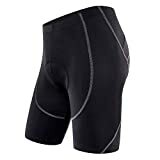 MOISTURE WICKING & BREATHABLE: The bike shorts men with padding are made of 80% Nylon and 20% Spandex that have fine air permeability, moisture absorption and sweat releasing properties. Therefore, it can prevent you from any discomfort such as senses of greasy or sticky while you are riding and can keep your skin breathing freely. 4D PROTECTION PAD:6 layers of high impact foam offer comfort and high protection from injuries during long-distance cycling. A highly engineered design includes a four-way stretch and laser-cut rounded edges for a smooth and chafe-free feel. The surface of the pad is ultra-perforated, making it lightweight, breathable, and help to prevent saddle sores. NO RISK PURCHASE GUARANTEE：Definitely worth the cost compare to those top brand bike pants in quality, We are cycling supplies manufacturer and have a professional design team and independent design of product appearance.We're committed to providing 100% customer satisfaction, if you have any concern about our biking shorts and service, please do not hesitate to contact us. -Notice：★ The new upgrade of 4D pad thickness：increase from 1.5cm to 2.5cm and provide the best comfort and protection. Waist: S 25"-30", M 27"-32", L 29"-33", XL 30"-36"
Hip: S 30"-36", M 32"-37", L 33"-39", XL 35"-40"
Length: S 17", M 17.5", L 18", XL 18.5"
Don't be hesitate, move it right now. Choosing what you like. We will be happy to serve you.